"Having lost his front paw and his teeth and to continue his life as an ordinary cat, I think that took a lot of courage." No one seems to know where he came from or, more importantly, how he came to lose his left front leg and all of his teeth. He simply moseyed into City Hall one day in June of 1979 and Natchez never has been quite the same since. Dubbed Tripod by the politicians, he went on to spend four years at City Hall before crossing the Rainbow Bridge on October 9, 1983. During the interim, he became such a national sensation through various appearances on talk shows that food and monetary donations for his care poured in from around the country. The Reverend Darian Duckworth of Grace United Methodist Church led those assembled in prayer while Byrne and others waxed nostalgic about their long-departed and obviously still terribly missed companion. The attendees later repaired to City Council chambers where a ten-minute news feature about Tripod was shown. It was not always smooth sailing for Tripod, however, in that he at first received only a tepid welcome. Gradually the politicians warmed to his presence and started feeding him table scraps until he was eventually provided with regular cat food as well as a bed and a litter box. Being allergic to cats, alderman Hall Wilson tried to get Tripod evicted from City Hall almost as soon as he was installed but was thwarted by his colleague Al Graning who, bless his soul, counter proposed that Wilson be removed. When a rare snowstorm struck the Mississippi River town Wilson was pressed into service feeding Tripod and from that time forward the two buried the hatchet. Over the years other individuals attempted to legally adopt Tripod but by that time he had become such a fixture at City Hall that Byrne was not about to let him go. "It was just a feel-good situation with Tripod," he told The Natchez Democrat in the October 2nd article cited supra. Although The Natchez Democrat does not broach the subject, it is suspected that the city was better governed during Tripod's tenure. After all, cats in their own inimitable way are known to bring a measure of bon sens and decency to their surroundings. While the willingness of politicians to befriend homeless cats definitely is a positive development, they need to be doing much more in order to protect the rights of cats and other animals. First of all, it is imperative that they not only add some much needed teeth to existing anti-cruelty statutes but also prevail upon police, prosecutors, and judges to start taking animal cruelty seriously. 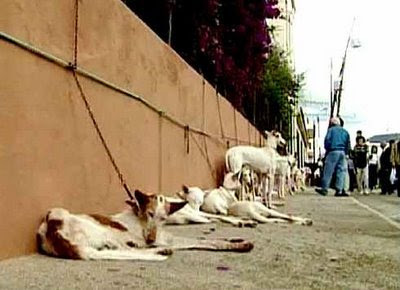 Second of all, they must put an end to the annual slaughter of tens of millions of cats, dogs, and other animals by shelters, Animal Control, and veterinarians. There is not any conceivable way that these mass killing can be morally justified. Elected officials also should stop enacting ridiculous leash, anti-feeding, and anti-roaming statutes. A cat is not a dog. 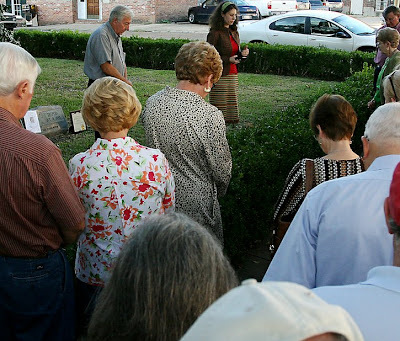 Through the compassion that they bestowed upon him during his brief stay at City Hall and by holding the recent memorial service, politicians in Natchez have demonstrated that they cared deeply about Tripod. The time has come, however, for them to extend their circle of compassion to include all cats as well as other animals. 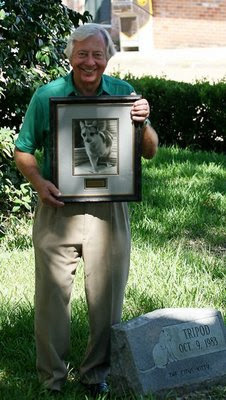 There could not be any better way of honoring Tripod's memory and repaying him for all that he did for the city of Natchez than if City Council were to take bold and decisive action in order to stop the abuse, killing, and exploitation of all cats, dogs, and other animals. If he were still alive, Tripod would expect no less of them. Photos: Steve VanGunda of The Natchez Democrat. "Laugh, laugh, I thought I'd die. It seemed so funny to me." Consequently, it did not come as any surprise that she also was yukking it up at her sentencing on November 14th. As things turned out, she certainly had good reason for her unbridled mirth. Sentenced only to nine-months of supervision and ordered to pen a letter of apology to the grief-stricken crew of the HMS Belfast, she probably still is splitting her sides at Green's imbecility. "I don't know what to say," she later confessed to the BBC on November 14th. (See "Ship's Cat Girl Told to Apologize.") "I'm sorry for what happened." Green, who could have done both cats and society a huge favor by locking up the yob for six months and fining her twenty-five-thousand pounds, instead ludicrously recommended that she spend part of her probationary period working on the HMS Belfast and with animals. The only good that possibly could ever come out of such an absurd arrangement would be if one of the crew took matters into his own hands and tossed her overboard into the Thames. Although Green was totally unwilling to punish Jessica, she laid on the phony-baloney moral indignation with a trowel for the benefit of court watchers and the media. "The offense is one which has caused enormous distress not merely to staff of HMS Belfast but a lot of right-minded members of the public who were upset by your disgraceful behavior," the BBC reported her as lecturing the defendant. Green's thoroughly disgraceful abdication of her responsibility to enforce the animal cruelty statutes drew the immediate ire of Moggies. "This is an absolute disgrace! So-called British justice has failed miserably to allow this teenager to go free, especially with the contempt she has shown is just not right," the organization stated on its web site. "The judge should be barred from ever presiding over a court again," it continued. "And why is she (the convict) allowed to be anonymous? She should be named and shamed." While that definitely would be a step in the right direction, it probably would not have much of an impact upon an individual as far gone as Jessica. What she needs is a good public horsewhipping. Prosecutor Scott Jarmy was equally perturbed by Green's idiotic ruling. "We were hoping for a brief custodial sentence," he told the BBC in the article cited supra. "She showed contempt for the legal process by laughing during the trial and today (during sentencing) but hopefully she will learn from what happened." Au contraire, the only thing that she is going to take away from this experience is an abiding belief that crime pays. More to the point, it was not she that made a mockery of the law, but rather Green. In The Laws, Plato wrote that individuals are conditioned to be good citizens through a system of rewards and punishments. In other words, those who harm society must be punished while those who contribute to the common good should be rewarded. By that yardstick, most modern societies are miserable perversions. Not only are evildoers seldom punished but those who obey the laws are looked upon as dunces. Even such latter-day thinkers as Friedrich Nietzsche decried the unwillingness of western societies to punish criminals. Under such aberrant conditions it is not surprising that countries such as England and the United States are falling apart at the seams. A spokeswoman for Kilo's former haunt, the Battersea Dogs and Cats Home, did the best that she could in order to put a good face on an atrocious ruling. "We are pleased that the culprit was apprehended and convicted in court for this awful act of animal cruelty," she told the BBC. Although the crew of the HMS Belfast has received letters of condolence from around the world, to date they have not publicly commented on whether they will welcome Jessica back aboard. Hopefully, they will demur because to do so would be an affront to Kilo's memory. Besides, the crew may have adopted another cat and the last person that they would want anywhere near it would be Jessica. "She really was in a very bad state and the fact that it was an intentional act is just appalling." Scarcely a minute ticks off the clock without at least one defenseless cat somewhere in the world being horribly victimized by an unprovoked act of violence. That is not news in itself but the elaborate lengths that ailurophobes are prepared to go in order to commit their heinous crimes continues to shock the conscience. A good case in point was the dastardly act of cruelty perpetrated against a nameless four- to five-year-old white cat outside a pub called The Old Ship at 44 Main Street in Arklow on the east coast of Ireland on October 29th. That was when one or more cretins jammed a firecracker into the female's left ear and lit the fuse. Left for dead, she was discovered by bar patrons at 11 p.m. and rushed to Avondale Veterinary Hospital where Mairead Berkely treated her for shock and monitored her condition throughout the night. The following afternoon she and colleague Tommy Heffernan performed three hours of emergency surgery on the cat during which time her broken jaw was wired, damaged tissue removed from her ear, and a surgical drain inserted. Miraculously, she is expected to live although she will be deaf. That may not be quite as terrible as it sounds in that since a significant percentage of white cats are deaf she already might have been hearing impaired. Injuries to her brain, eyes, and motor skills are of paramount concern but since the veterinarians have not publicly commented on those issues it is impossible to speculate as to the quality of life that she will enjoy. Because of her friendly disposition, she quite obviously is a domesticated cat although at last report no one had come forward to claim her. To their credit, Berkely and Heffernan are treating her gratis and have pledged to secure a permanent home for her as soon as she recovers from her injuries. In an age where most veterinarians insist upon being paid advance for their services, cat-lovers are in Berkely's and Heffernan's debt for the compassion and generosity that they have showered upon this horribly abused cat. They truly are a credit to their profession. "She really was in a very bad state and the fact that it was an intentional act is just appalling," Julie Doyle, manager of the hospital, told the Belfast Telegraph on November 11th. (See "Firework Put in Cat's Ear.") "Those who carry out such cruel acts should take a look at the damage they cause and realize it is a very serious situation." On that last point, she is making the fatal mistake of confusing evil with ignorance. Individuals who commit acts such as this do so fully cognizant of how much pain and damage their actions are going to engender. That is how they gets their kicks and no amount of schooling is going to transform them into law-abiding citizens. Moral outrage and indignation also have lost their sting. Consequently, the only remedy is to bring the culprits to justice as soon as possible, convict them, and then line them up against a wall and shoot them. They are not fit to go on breathing. As far as it is known, no arrests have been made in Fifi's death and the outcome in Arklow more than likely will be the same. The police do not take animal cruelty seriously and on those rare occasions when a conscientious district attorney does prosecute judges invariably turn loose the abusers and killers. In addition to the constables' total lack of interest, there are several other striking parallels between the two cases. For starters, both victims were house cats and it was precisely their domestication that made possible their abuse. In this respect at least, the ingrained fear that ferals have of humans gives them a big advantage over their far more trusting domiciled cousins. This benefit is more than negated, however, by the numerous deprivations that they suffer which in turn make them easy prey for skilled trappers who starve them half to death in order to rob them of their freedom, fertility and, quite often, lives. Secondly, both incidents occurred outside drinking establishments. While alcohol definitely played a part in Fifi's death, it is yet to be determined what, if any, role it played in the attack upon the cat in Arklow. In his 1974 recording "Streets of Arklow," Van Morrison spoke of the city as "God's green land" and extolled its "drenching beauty" and "clean souls." There is no doubt a scintilla of truth in those lyrics but the souls of those persons who assaulted this defenseless cat are anything but clean; au contraire, they are every bit as black as the one that belongs to the devil that they serve. "Ask the experimenters why they experiment on animals and the answer is: 'Because the animals are like us.' Ask the experimenters why it is morally okay to experiment on animals, and the answer is: 'Because the animals are not like us.' Animal experimentation rests on a logical contradiction." Cystic fibrosis is a horrible disease. The excess, blood-streaked mucus produced in the lungs of sufferers not only leads to persistent coughing and breathing difficulties but, quite often, necessitates lung transplants as well. As a consequence, physical activities are almost impossible to sustain. Similar problems occur in the pancreas and throughout the digestive tract where excess mucus leads to a loss of both appetite and weight which ultimately stunts growth. Diarrhea, constipation, and related excretory difficulties are common as are prolapsed rectums. The loss of salt through the pores of the skin leads to dehydration and low levels of the mineral in the blood. Polyps often form in the nose and sinuses and weak bones, swollen joints, arthritis, and a clubbing of the fingers are common skeletal ailments. Ninety-five per cent of male sufferers are infertile and many females have difficulty conceiving. All of those afflicted have a life expectancy of less than half that of normal individuals. Treatments are available which can alleviate some of the discomforts but there is not any cure. As dreadful as all of that is, up until now the ravages of cystic fibrosis have been confined to humans. All of that is about to change now that the scientific community unilaterally has decided to clone cats with this diabolical disease. Of course, the public will be spared the spectacle of cats tragically being reduced to wheezing, limping, and incontinent blobs of fur dying agonizingly slow deaths on city sidewalks and doorsteps. Although these atrocities will remain out of sight and out of mind, they nonetheless already are occurring every day of the week in vivisectors' laboratories all around the globe. He, and others like him, will be used to breed millions of replicas who in turn also will carry the deadly genes that cause cystic fibrosis and other human maladies. From these despicable crimes, vivisectors claim that they are going to find cures for just about all diseases afflicting the human race. Man is then going to conveniently hopscotch over the corpses of all the dead cats and other animals that he has slaughtered and go on to live forever. At least, that is the game plan that the vivisectors have in store for themselves and the capitalists that they serve. Even if wholesale cures are discovered, it is a sure bet that the hoi polloi never will benefit from them. Instead, they will be left to get by any way that they can; that is, if they are able to stave off being genetically compromised themselves. At Mr. Green Genes' coming out party, however, it was all fun, games and, above all, some of the biggest lies ever told. Imbecilic host Amy Robach certainly did her part to make the event a roaring success by not asking Dresser one halfway intelligent question. It is difficult to say, but perhaps she truly is that callous. On the other hand, it must be said that her abysmal ignorance sure looked like the genuine article. MSNBC's disgraceful scraping and bowing before such a monster as Dresser is just one more classic example of the capitalist media's total dishonesty and corruption. Instead of enlightening the masses, it and other media outlets strive to make blockheads out of everyone. Dresser got the liars' contest off to a whopper of a start by declaring, "It's totally harmless." (See MSNBC, October 23, 2008, "Me-Yow! 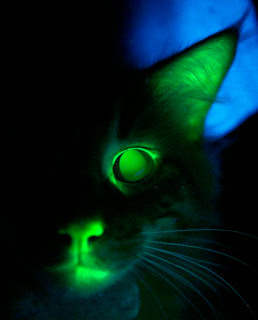 This Cat Glows in the Dark.") "He's just a normal cat; he doesn't know he's glowing." 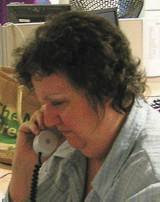 Martha Gomez, another one Dresser's hired cat-killers, joked about the contents of his litter box glowing while Leslie Lyons of UC-Davis chirruped, "The glowing part is the fun part." Described as being deeply suspicious of strangers and not liking to be held, poor little Mr. Green Genes did not appear to be having much fun as he was bandied about and paraded before the cameras like a new toy. The fact that he spends most of his free time sleeping is an indication that his environment lacks stimulation and that he could be suffering from depression. ACRES' immediate plans call for him to be used as a stud in order to breed additional fluorescent cats. Should he somehow make it through all of that, Gomez has pledged to allow him to live out his few remaining days at her house. The breeding, false imprisonment, torture, maiming, and killing of cats in the name of science is certainly nothing new. For hundreds, if indeed not thousands, of years they have been cut up by vivisectors studying the brain and central nervous system, heart disease, sexually transmitted diseases, Alzheimer's, diabetes, and an assortment of other ailments. They also have been dissected and tortured in order to provide researchers and others with cheap thrills. Reggie Edgerton of UCLA, Serge Rossignol of the University of Montreal, and others have fashioned careers out of breaking the backs of cats in a futile search for a cure for spinal cord injuries. Edgerton's crimes were funded in part by Superman, Christopher Reeve, who was so desperate to walk again that he did not care how many cats that he crippled in the process. Needless to say, that is hardly the kind of behavior that one would expect from a super hero. Moreover, ten of the ninety-eight Nobel Prizes awarded by the Royal Swedish Academy of Sciences in physiology and medicine over the years have gone to cat-killers. Due to the inexorable march of scientific progress, the maiming and killing of cats is becoming considerably more systematic, widespread and, above all, sadistic. There are at least three reasons for this and first and foremost among them are recent advances made in cloning. He, unfortunately, has rebounded from his failure with cats and now is back in business cloning dogs at his new company, BioArts International. (See The New York Times, May 21, 2008, "Biotech Company to Auction Chances to Clone a Dog.") This is an especially dire development for dogs who, because of reproductive peculiarities, are considerably more difficult to clone than other mammals. In order to pull it off, BioArts has formed a partnership with Sooam Biotech Research Foundation in South Korea which employs Hwang Woo Suk who helped to clone the world's first dog, Snuppy, for Seoul National University in 2005. (See Cat Defender post of August 15, 2005 entitled, "South Koreans Clone World's First Dog; Vivisectors and Stem Cell Proponents See $$$.") Hwang, it never must be forgotten, was later discovered to have manufactured research that purported to show that he had cloned human embryos. Established in 1996 in order to save endangered species, ACRES subtly has reinvented itself as a latter day Island of Doctor Moreau where cats are cloned with horrible diseases and then peddled to vivisectors. Nevertheless, the organization is still bamboozling the public out of its shekels on the pretense that it is working to save endangered wild cats and other species. For instance, on its web site the inveterate liars and charlatans proclaim: "The knowledge gained through research at the Center will help scientists and conservationists cope with threats to the most seriously endangered species by developing new reproductive technologies and reintroduction techniques necessary to ensure their long-term survival." Au contraire, the exact opposite is occurring. ACRES is depleting the population of wild cats by removing them from their natural habitats and imprisoning them in its laboratories. Furthermore, although it runs off at the mouth about returning species to the wild, no specifics are given on its web site. Although numerous advancements have been made in mammalian cloning during the past decade, it is still a technology in its infancy with a success rate of only about one per cent. In a review of published studies involving cats and dogs, the Humane Society of the United States (HSUS) and the American Anti-Vivisection Society (AAVS) concluded that three-thousand-six-hundred-fifty-six cloned embryos, three-hundred-twenty oocytes, and two-hundred-fourteen surrogate mothers had been sacrificed just to produce five cloned dogs and eleven cloned cats that had survived for longer than thirty days. While the mortality rate of donor cats and surrogate mothers is a tightly guarded trade secret, it is impossible to believe that their lives could be anything other than pure hell. First of all, DNA must be collected from them. Although obtaining it from skin cells is the least invasive way of getting it, there are more invasive procedures as well. Secondly, hysterectomies are performed on female cats in order to collect occytes. The fused embryos must them be surgically implanted in surrogate cats and powerful hormones administered in order to jumpstart their reproductive cycles. Finally, since clones tend to be significantly larger than normal kittens, the mother cats must be cut open and their kittens surgically removed. Even those clones that do survive tend to age far more rapidly than normal kittens due to a shortening of their chromosomes caused by the cloning process itself. The newborns additionally are prone to developmental abnormalities, diseases, compromised immune systems, and higher rates of infection. It therefore readily can be seen that everything Dresser had to say about Mr. Green Genes was a pure fabrication. Although he looks relatively healthy at the moment, his sojourn on this earth is destined to be a brief one plagued by all sorts of maladies. More to the point, the witless Robach should have asked Dresser how many cats she had killed in the production of Mr. Green Genes. Despite what Gomez said, it is highly unlikely that he ever will be allowed to retire. Rather, he is destined to spend his entire life in a laboratory being manipulated and used to impregnate other cats. Should he prove to be either infertile or his health deteriorate, it is hard to imagine either Dresser or Gomez hesitating to sign his death warrant. Tant pis, that is a best case scenario. Since ACRES is so anxious to breed him, that would seem to imply that his DNA already has been further manipulated so as to cause him to develop some hideous disease. After all, fluorescent cats per se are of limited value to vivisectors. These proteins are thus fused with deadly diseases, such as cystic fibrosis, and then cloned into cats and other animals. Because they glow in the dark, researchers are able to immediately determine not only what cells and tissues the diseases have invaded but also if they have been passed down to naturally-bred offspring. 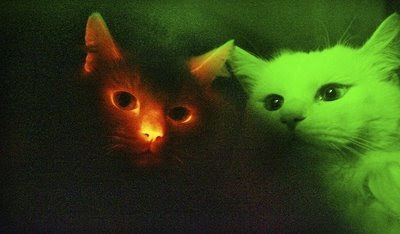 Although Mr. Green Genes has been hailed as the first green fluorescent cat produced in the United States, scientists at Gyeongsang University in Jinju produced a Turkish Angora that glowed red in the dark in early 2007. (See photo above.) That cat was later killed off in order that the researchers could perform a necropsy on it. Lead researcher Kong Il-keun gave a portent of what was to come when he boasted to The Independent on January 2, 2008, "The technology used to produce cloned cats with manipulated genes can be applied to clone animals suffering from the same diseases as humans." (See "Bizarre Experiments: Why Did They Do That?" and Cat Defender post of February 1, 2008 entitled "Cats Are Destined to Be Treated as Horribly as Lab Mice Now That Vivisectors Are Able to Clone Them with Altered Genes.") Mr. Green Genes therefore is the embodiment of Kong's prediction. 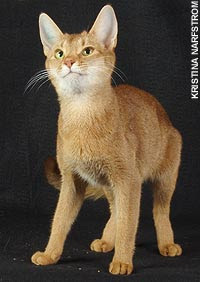 "The domestic cat was included in this mammalian genome set mainly to stimulate genome research on a species that provides a large number of important human medical models," Joan U. Pontius and her colleagues wrote in volume seventeen, number eleven of Genome Research on November 1, 2007. (See "Initial Sequence and Comparative Analysis of the Cat Genome.") "Cats, like dogs, enjoy extensive veterinary medical surveillance that has described two-hundred genetic diseases analogous to human disorders." As counterintuitive as it may sound, simply taking cats and dogs to the vet is costing millions of their cousins their lives because data collected during these visits is in turn peddled to vivisectors. Moreover, the same cruel fate that now has been bestowed upon cats and dogs awaits at least another two dozen mammals who also have had the secrets of their genetic makeup unraveled by NCI. More specifically, decoding the feline genome has allowed scientists to identify several hundred thousand genetic variants which they claim can be used to determine the genetic basis of more than two-hundred-fifty hereditary diseases afflicting both cats and humans. In addition to cystic fibrosis, researchers plan on cutting up cats in order to study, inter alia, diabetes, rotavirus, poxvirus, herpes, Q-fever, chlamydiosis, AIDS, hemophilia, Lupus, and retinitis pigmentosa. Even national security spooks are intrigued by the fact that cats are immune to anthrax. The cat who had her DNA decoded by researchers at the University of Missouri at Columbia was a four-year-old, inbred Abyssinian named Cinnamon who suffered from retinitis pigmentosa. (See photo above.) From this research, scientists were able to isolate the gene responsible for the disease and are now implanting silicon chips in the eyes of a colony of captive cats. Even if a cure could be found for feline blindness, the pain and cost of such surgery would have to be weighed against the fact that cats lead such terribly short lives. Moreover, it is morally indefensible to allow scientists to clone blind cats just so that vivisectors can imprison them in their laboratories and manipulate them at will. "This is new and very useful information," Susan Little of the Winn Feline Foundation gushed to the Washington Post on March 17th. (See "On the Trail of the Cat, Scientists Find Surprises.") "It helps improve the ability of breeders to reduce the prevalence of disease by developing a healthy breeding program. It's extremely important." With shelters, animal control, and veterinarians in the United States exterminating an estimated fifteen million unwanted cats each year and millions more living on the street, the last thing that this world needs is more purebred cats. Besides, purebreds are subject to so many genetic abnormalities that the only humane solution is to put a stop to the inbreeding. Taken all together, advances made in cloning, the development of fluorescent proteins, and the unraveling of the mysteries of the feline genome have opened up a Pandora's box of horrors for cats. With these tools at their disposal, there will not be any end to the crimes that vivisectors are destined to commit against cats. 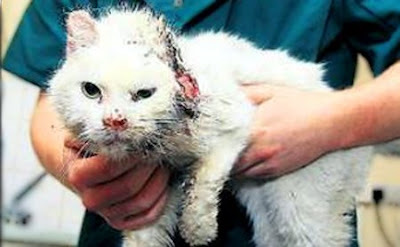 Appealing to the scientific community to respect life and to stop torturing and killing cats is a total waste of time. Neither the petit fait that the results of animal tests are seldom applicable to humans nor the immorality of their actions faze them the least little bit. As far as they are concerned, torturing and killing cats is not only profitable but a privilege of their profession. Professor Charles R. Magel summed up rather well how their twisted minds operate when he once wrote: "Ask the experimenters why they experiment on animals and the answer is: 'Because the animals are like us.' Ask the experimenters why it is morally okay to experiment on animals, and the answer is: 'Because the animals are not like us.' Animal experimentation rests on a logical contradiction." Quite obviously, individuals who think and behave as they do are beyond all redemption. Much the same can be said for all politicians and the capitalist media. 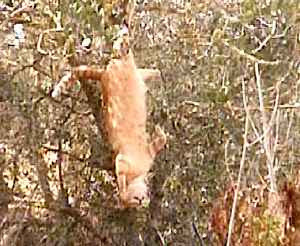 Even many animal rights groups either do not care or, worst still, are in cahoots with the killers and abusers. The general public should care, especially since eugenics is just around the bend, but it does not. There are hundreds of millions of cat-lovers around the world but they cannot be depended upon to take action. This has been demonstrated writ large by the willingness of many of them to either abandon their companions or to dump them at shelters simply because of the economic downturn. Consequently, the time has arrived for more responsible individuals and groups to take far more drastic action in order to stop the abuse and killing. Photos: MSNBC (set of the Today Show), ACRES (Mr. Green Genes), Gyeongsang National University (red fluorescent Angora), and Kristina Narfstrom of the University of Missouri at Columbia (Cinnamon). "I noticed three people at the end of the gangway. One of them picked up the ship's cat and dropped him over the side of the rail. 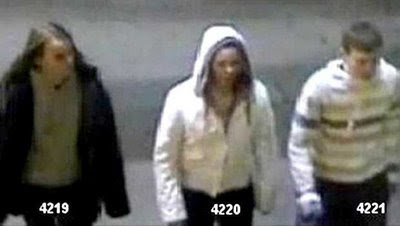 The person was wearing a distinctive white hooded top. It stood out." 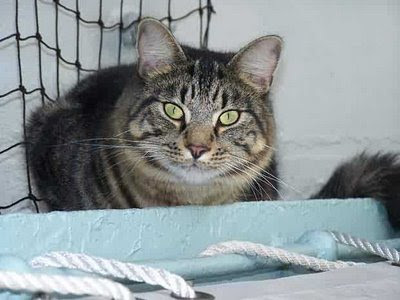 A sixteen-year-old miscreant from the borough of Enfield in north London was convicted on October 23rd in Camberwell Green Youth Court for hurling the HMS Belfast's resident mascot and mouser, Kilo, to his death in the Thames at 6 a.m. on February 9th. She is scheduled to be sentenced later this month and could receive up to six months in the clink as well as be fined a maximum of twenty-five-thousand pounds. To her credit, Judge Sue Green was not so easily bamboozled. "I do not believe the truth of the evidence these three young people have given," she said. "I am entirely satisfied that they were all drinking heavily. The boyfriend, by his own admission, was completely out of it," she continued. "The defendant denied she had been drinking but I do not accept that." Jessica's unnamed boyfriend, also sixteen years of age, was even so bold as to claim not only that he had killed Kilo but that he was justified in doing so because the cat had scratched him. (See photo above of Kilo.) In doing so, he was sans doute copying a page from the playbook of notorious Manhattan cat killer Joseph Petcka. There can be little doubt that Jessica richly deserves to be given the maximum sentence allowable under the law. Furthermore, she should be given extra time for perjuring herself. The same holds true for her boyfriend. Although it is not about to happen in a million years, Judge Green should do both cats and society a huge favor and put away all three offenders for life. Since moral character is formed at an early age, it is hard to imagine any of them ever amounting to anything other than the vilest of career criminals. More to the point, they should have been tried as adults in the first place. If they are old enough to commit the crime, they are old enough to do the time. Once they have put Kilo's murder behind them, they undoubtedly will go on to commit further outrages against both animals and humans. Moreover, it is highly unlikely that Kilo is the first cat that they either have abused or killed. Their worthless parents also should be held legally accountable for allowing them to stay out all night boozing and committing crimes. Their dereliction of duty is almost as reprehensible as the conduct of their children. Kilo is, unfortunately, dead and nothing is going to bring him back but Judge Green can let it be known in no uncertain terms that killing cats will not be tolerated by making examples out of Jessica and her cohorts. Such a ruling would go a long way towards not only saving the lives of innumerable cats, but also in checking the spiraling cycle of violence directed against them all across England. Photos: HMS Belfast (Killers and Kilo), Lisa Altobelli (Norman), and Hermann of the New York Daily News (Petcka). "I'm ecstatic. I knew he would be back. He's looking worse for wear but he's getting better." The four-year-old moggy was collared on October 23rd by forty-six-year-old computer technician Gavin Lewis of Raleigh Road in the Harringay Ladder section of the north London borough of Haringey. This was a scant five roads removed from the Falkland Road residence of Miles' brother, David Jones, where the overweight tomcat had been banished in order to shed a few pounds. For whatever reason, be it homesickness or a love of his mistress's cooking, Ginger Boy did not care for the Fat Farm and soon did a runner. When Miles responded by blanketing Harringay Ladder with "Lost Cat" posters Haringey officials threatened to fine her seventy pounds, sterling that is, of her own per flier. It is unclear, however, why Lewis elected to feed Ginger Boy in his yard for a fortnight before grabbing him with his hands as opposed to setting a humane trap which would have brought this unfortunate incident to a close much sooner. Moreover, it is not even known if Miles was alerted to the fact that Ginger Boy was living on Raleigh Road. Ginger Boy undoubtedly lost some weight while he was on the street so Miles' experiment did succeed in a roundabout fashion but that is an extremely dangerous way in order to get a cat to slim down. Miles is indeed very lucky to have gotten him back alive. She apparently has, however, learned a valuable lesson from this traumatic event. "He's not going anywhere," she pledged to the Hornsey and Crouch End Journal. While Ginger Boy's safe return is indeed a cause for celebration, the circumstances which prompted his exile to Falkland Road have not changed. Miles has eight other cats and Ginger Boy allegedly was banished because he was putting on extra pounds at the expense of his playmates. First of all, having nine cats under any roof presents several obvious problems but perhaps none more so that ensuring an equal distribution of grub. Putting out smaller portions in additional food dishes would make it more difficult for Ginger Boy to make a pig of himself. If that does not work, the next thing to try would be controlled feedings whereby the famished throngs are segregated and fed in different rooms with any leftovers being promptly removed. If available, a fenced-in and secure yard would be a good way to ensure that Ginger Boy gets plenty of exercise; if that is not feasible, it might be possible to train him to walk on a leash. Furthermore, it is axiomatic that keeping nine cats puts a premium on sanitation and socialization. 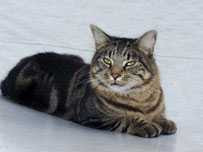 Miles therefore needs to put down at a minimum nine litter boxes and they should be emptied on a daily basis. Each of the cats needs to be groomed several times a week and checked daily for illnesses and injuries. They each additionally require personal attention and petting. She was found on October 8th a few hundred feet from home at the residence of neighbor Charlie Place on Albert Street. Malnourished and exhausted, she was near death. "She was in the middle of the garden and it looked like she must have been hit by a car because she couldn't really walk," Place told This Is Kent on October 17th. 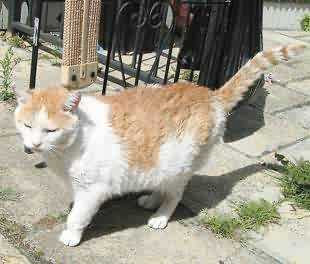 (See "ASBO Cat Comes Home to Whitstable.") "She hissed at me when I tried to approach her but I couldn't just leave her there." 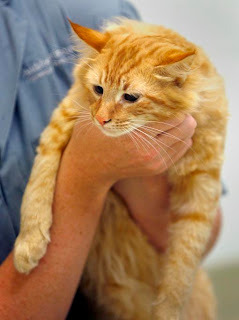 Having seen the "Lost Cat" posters that the Copes had put up in the neighborhood as well as a news story about her disappearance in the weekly Whitstable Times, Place immediately contacted Animal House Veterinary Services in nearby Herne Bay who then reunited Milly with her family thanks to an implanted microchip. "I don't think she would have made the weekend; she was on her last legs," Stephen told This Is Kent in the article cited supra. "It was sad because of the state she was in but now we've got our moggie back." After a quick trip to Roger Baker's Veterinary Practice in Herne Bay, Milly soon was sitting up and eating again. "She's very wobbly because she's lost a lot of weight. She can only do a few steps at a time and then she has to sit down," Heather added. "We will just have to build her back up again." In another classic example of politicians having gone completely off the rails, the Copes initially were threatened by a community warden with not only a fine but an Anti-Social Behavior Order (ASBO) as well for putting up their "Lost Cat" fliers. The Canterbury City Council later backed down and apologized. The warden's asinine behavior left Stephen, justifiably, seething. "It's unbelievably petty and it has made us so furious. This person was a real job's worth," he complained to the Daily Mail on September 4th. 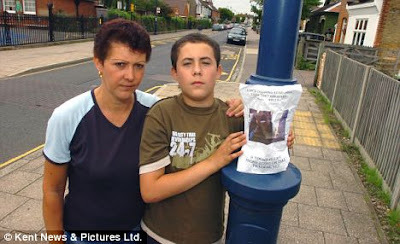 (See "Couple Threatened with Spot Fine for Anti-Social Behavior after Putting Up Posters of Missing Cat.") "Milly is a member of our family, we're devastated she has disappeared." During the interim, the Copes were assisted by retailers in their neighborhood who helped them to circumvent the Council's ban by displaying posters of Milly in the windows of their shops. This is a kindness that Heather has not forgotten. Although Milly is expected to make a complete recovery, she will be forced from now on to share her turf with a two-year-old cat named Mango that the Copes adopted in early October after they had given up all hope of ever seeing their beloved tortoiseshell again. 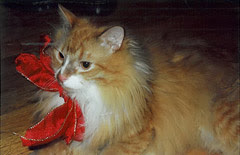 Several common threads are readily discernible in the misadventures of both Ginger Boy and Milly. First of all, the fact that both cats were found nearby underscores the point that cats are territorial. Consequently, cats usually do not stray too far from home unless they either have been abducted or accidentally transported out of the area inside either popular modes of conveyance or shipping crates. While cats have been known to undertake long and perilous journeys in order to return home, those cases are fairly rare. Search and rescue operations therefore should be concentrated nearby. Since cats prefer to sleep during the day and to hunt at night, it is essential that aggrieved cat owners sacrifice a few nights of repose if they ever expect to see their beloved companions again. C'est-a-dire, if one expects to catch a cat one must first of all learn to think like one. These two cases also demonstrate that "Lost Cat" posters do get results. "It was heartbreaking pulling the posters off the lampposts and (it) has seriously affected our chances of finding our cat," Stephen lamented to the Daily Mail back in September. Internet postings and newspaper articles also are invaluable in helping distraught cat owners to locate their companions. The management of the Hornsey and Croch End Journal, the Whitstable Times, and the Daily Mail are therefore to be commended for their willingness to be of assistance in the rescues of Ginger Boy and Milly. Photos: Hornsey and Crouch End Journal (Ginger Boy and Miles) and Kent News (Milly as well as Heather and Daniel Cope). Now, isn't it a shame? Strip away all hope of redemption and the customary happy ending and it would be a storyline worthy of Charles Dickens. Since it is more of a case of German idealism floundering on the rocky shores of reality, it perhaps would be better suited for the pen of Hermann Hesse. 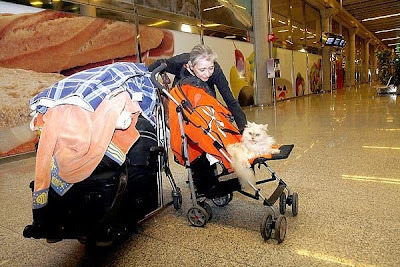 In Palma de Mallorca in the Balearic Islands, a forty-eight-year-old petite and shy German woman has lived in exile at Son Sant Joan Aeropuerto for more than ten years. Although she is variously known as Biggie, Bettina, and Brigitte, staff at the airport refer to her simply as "La mujer del gato." That is because her sole companion is a white Persian cat that she calls Mumu. Little else is known about him. He could have been brought to Palma by Brigitte, picked up somewhere on the island, or more than likely rescued from the grounds of the airport itself. After all, most airports have substantial populations of feral and stray cats. This is due first of all to the fact that baggage is not the only thing that careless airline personnel are notorious for misplacing. Despite the obvious hardships, Mumu appears not only to be well cared for but, perhaps more importantly, contented with his lot as well. "Er est wie ein Hund," Brigitte told the Aachener-Zeitung on October 13th. (See "Wohnort Flughafen Palma, Abflughalle links.") "Ich gehe mit ihm kurz nach draussen und dann erledigt er sein Geschaft." She and Mumu sleep sprawled across the benches in the terminal and she does her laundry and ablutions in the restrooms. She takes her meals at the airport's cafes and spends the remainder of her days reading novels and newspapers as well as working crossword puzzles. Not a great deal is known about Brigitte and even most of the airport scuttlebutt never has been confirmed. It is nonetheless fairly safe to say that she hails from a small town in Rhineland Pfalz where her eighty-one-year-old mother still resides. She worked as a customs specialist until 1989 when that job ended along with an ill-fated romance. She then fled to Mallorca where she worked for a while as a waitress in Cala Ratjada and later as a home care attendant in Cala d'Or. Never plentiful to begin with, the work soon ran out and she wound up marooned at Son Sant Joan. She has not given up but it is not easy for a German ex-pat to secure employment in Mallorca despite the fact that the Treaty of Maastricht grants the citizens of all member states the right to travel, work, and live wherever they please within the European Union (EU). "Ich lese viel Zeitung. Vielleicht gibt es ja doch eines Tages mal wieder Arbeit," she told the Aachener-Zeitung in the article cited supra. Old prejudices never die, however, and most jobs in Mallorca go to Spaniards. "Inzwischen werden hier aber nur noch Spanier beschaftigt," she complained to the Aachener-Zeitung. Once again, political integration and multiculturalism have been exposed to be every bit as fraudulent as their equally mentally retarded siblings, immigration and colonialism. Consequently, she is forced to scrape by on odd jobs and whatever food and money she is given by the twenty-two-million passengers who fly in and out of Son Sant Joan each year. A popular vacation destination with Germans since the early 1950s, it is home for at least part of the year to such Teutonic notables as former Formula One champion Michael Schumacher, model Claudia Schiffer, former tennis star Boris Becker, and pop singer Heino. She should not, however, be mistaken for a bum. The food and money that she receives is freely given, not panhandled. She also keeps herself clean and is well-groomed in her customary jeans and pullovers. "Ich store niemanden," she told the Aachener-Zeitung. "Ich klaue nicht, ich bettele nicht, ich tue nichts Verbotenes." Nevertheless, reaction to her presence has been mixed. Acting in their dual capacities as lickspittle for the capitalists and the bourgeoisie on the one hand and as the persecutors of the poor on the other hand, the police initially attempted to give her the bum's rush but were ultimately forced to back down. The harassment that she and Mumu have been forced to put up with at the hands of the police and others in positions of authority is no doubt precisely the type of blatant class discrimination that Anatole France had in mind when he sarcastically spoke of "la majestueuse egalite des lois interdit aux riches comme aux pauvres de coucher sous les ponts, de mendier dans la rue, et de voler du pain." She also appears to be well-liked by the workers at the facility, some of whom even have expressed compassion for her. "Things didn't work out so she has come to live here," housekeeper Maria Jesus Rueda Garcia related to The Guardian. "She can get by and is not a beggar because she has income. I have seen her take money out of the Cashpoint. This could happen to us all." All things considered, Brigitte seems to have adjusted as well as possible to her reduced circumstances. "Neunzig Prozent der Leute sind nett zu mir," she told the Aachener-Zeitung. "Ich fuhle mich eigentlich gut, wie Mitte zwanziger." The overly romantic Spaniards have theorized that Brigitte was abandoned by a lover in much the same fashion as Theseus deserted Ariadne on Naxos. This is a claim that she categorically rejects. "Alles Unsinn," she declared to the Aachener-Zeitung. "Aber das meiste, was uber mich geschrieben wird, stimmt nicht." She certainly does not appear to be any crazier than anyone else, unless being poor, alone, and down on one's luck now is considered grounds for committing an individual to an insane asylum. Besides, millions of individuals have lost their economic footing in this rapidly-changing, corrupt-as-hell, globalized world. As Angleterre continues to morph into a police state, officials have begun handing out Anti-Social Behavior Orders (ASBOs) to individuals who take up residence at airports. So far, at least four residents of Gatwick have been ticketed and as a consequence face the prospect of spending substantial time in the cooler if they do not permanently vacate the premises. Although all airport residents have their own hard luck stories, one of the most intriguing involved a man known simply as John who lived at JFK in the early 1990s. Once a week he would be picked up outside British Airways by a chauffeur-driven limousine. He would return by limo later in the day sporting a haircut, shave, and clean clothes. Apparently there were strict limits to his benefactor's generosity because John was soon again forced to return to rummaging through the trash for his next meal. Perhaps the most famous airport denizen of all time was a stateless man who reportedly lived for eighteen years at Charles de Gaulle Aeroport near Paris. It was his plight that furnished the plot for the 2004 movie, The Terminal. Despite the hardships and blatant job discrimination, Brigitte insists that she likes the mentality of the Spanish and is dead set against returning to Deutschland. "No way. Life is better for me here," she declared to The Guardian in the article cited supra. If she ultimately decides to stay on in Palma, her options are rather limited. Being an EU citizen, she is eligible for financial assistance from the Mallorcan authorities but for whatever reason she has chosen not to pursue that avenue of endeavor. Although she is willing to work, the discriminatory hiring practices of the Spanish limit what she can accomplish. Worst still, all of the hoopla churned up by the nosey capitalist media has robbed her of her anonymity and undermined her position at Son Sant Joan. While it is conceivable that someone will come forward and offer her a legitimate job that pays a living wage, it is far more likely that she is going to be treated henceforth as a freak by the hoi polloi. 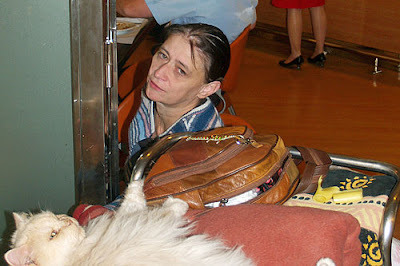 Being down and out is certainly bad enough in its own right, but caring for a cat on top of that is doubly difficult. Luckily for her, Mumu seems to be especially well-behaved and to have simple needs. Bullfighting and cockfighting are still major attractions and the catapulting of quails into the air so that they can be blown to bits by sportsmen is common. Ducks likewise are hurled into the sea and then hunted for sport. "Katastrophal" and "hoffnungslos" is how Marlies Beuse of the animal protection group Capdepera described the status of animals on Mallorca to Jungle World of Berlin on October 16th. (See "Rettet Udo! Nicht schon: Im Urlaubparadies der Deutschen fuhrt der Tierschutz ein Hundeleben.") She went on to state that they are treated as "Dinge behandelt" as opposed to living, sentient beings. 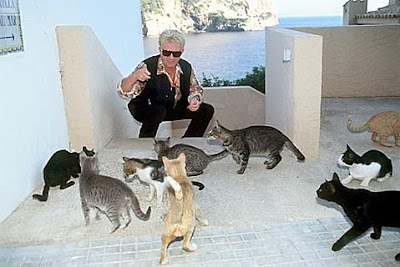 As those sickening revelations make painfully clear, there is not enough sun, sand, mild Mediterranean weather, rich celebrities, and multimillion-dollar villas scattered about the island to conceal the petit fait that when it comes to their treatment of the animals Mallorcans are savages. Being a cat-lover herself, it is difficult to imagine why Brigitte would want to remain in such a feline hellhole. Be that as it may, the atrocities committed against the animals of this world by the Mallorcans must not be allowed to overshadow the burgeoning problem of homeless pet owners, such as Brigitte. 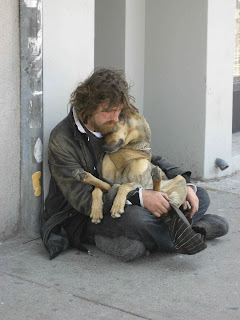 In the United States, for example, the National Coalition for the Homeless estimates that between five and ten per cent of those living on the street own cats and dogs. For all too long, these unfortunate individuals and their pets have been ignored and laughed at by society. Now, thanks to Feeding Pets of the Homeless, all of that is changing ever so slightly. Based in Carson City, this thoughtful organization collects and delivers pet food to food banks and soup kitchens in both the United States and Canada. These donations are then in turn doled out to the homeless so that they can provide for their cats and dogs. The grossly corrupt, inhumane, and unjust policies pursued by governments around the world already have turned tens of millions of individuals and their beloved companions into dispossessed beggars and this deplorable situation is only going to worsen in the days and years ahead. Of course, it goes without saying that most Americans do not want to hear that. In their eyes, poor people fully deserve their rags and distended bellies; only the crooks on Wall Street and the hypocritical bourgeoisie are entitled to wallow head over heels in governmental largess. Tant pis, they never will change their thinking on this subject. All is not lost, however, in that there are enlightened souls elsewhere who know differently and are more than willing to spare an ounce or two of kindness and understanding for the Brigittes and Mumus of this world. Photos: S. Llompart of the Mallorca Zeitung (Brigitte and Mumu), Deutsche Presse-Agentur (Brigitte and Mumu), Marl Aktuell (hung cat and starving cows), Horst Ossinger of the Press Association and Deutsche Presse-Agentur (Heino and cats), and Kirsten Bole of Feeding Pets of the Homeless (man with dog).